Head north for three great home haunts: Coffinwood Cemetery, Beware the Dark Realm, and Pumkin Jack's Haunted House. Here at Hollywood Gothique, we believe in recycling! That's why we're reusing material posted in our Halloween Haunt Odyssey: San Fernando Valley & Valencia. No, seriously - we're note "reusing." We're "re-purposing" - in order to highlight three excellent home haunts that are likely to attract less attention than they deserve because they're somewhat farther north than the popular San Fernando Vally haunts. Coffinwood Cemetery, Beware the Dark Realm, and Pumkin Jack's Haunted House rank among the most enjoyable Halloween attractions in Los Angeles county, and they're within fifteen minutes of each other, making them a great triple bill that justifies the trip up the 5 Freeway. 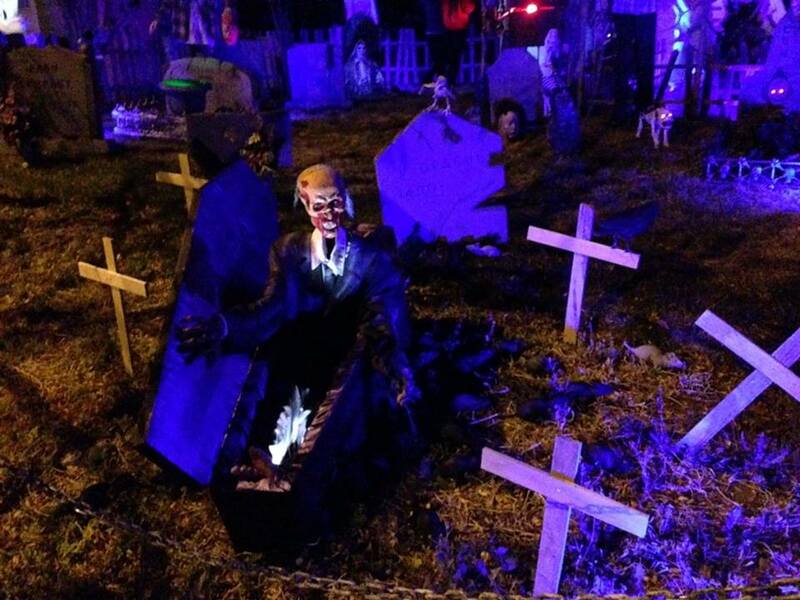 Coffinwood Cemetery is a combination of yard display and walk-through. Not exactly a maze, it offers a path through the front yard so that you can peruse the tombstones, skeletons, and ghouls (all home made except for the animatronics) before heading into a "mausoleum" - a convincing facade built over the garage, which leads to a single black-lit room with decorations and an electric chair. 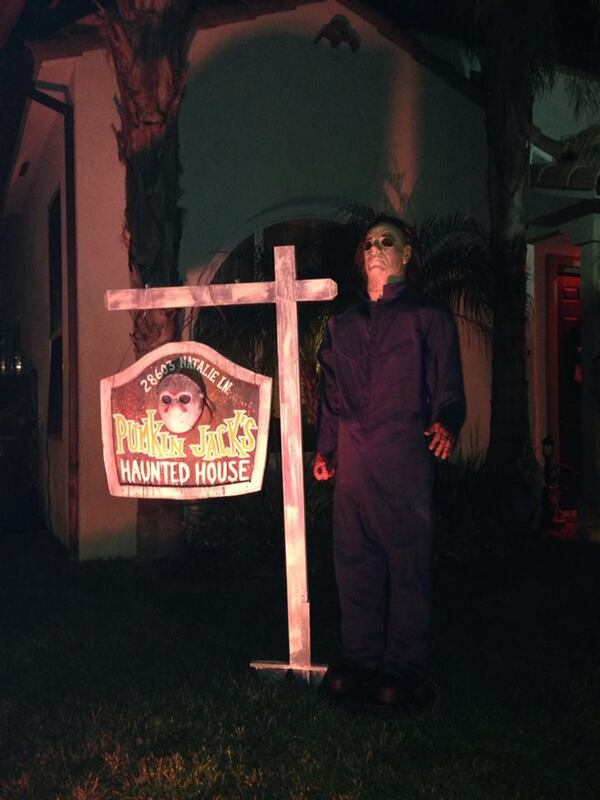 There were no scare actors when we visited on Friday night, but we understand they will be present tonight. Even without jump-scares, this home haunt is worth visiting just for the display, which also includes a giant spider atop the roof. 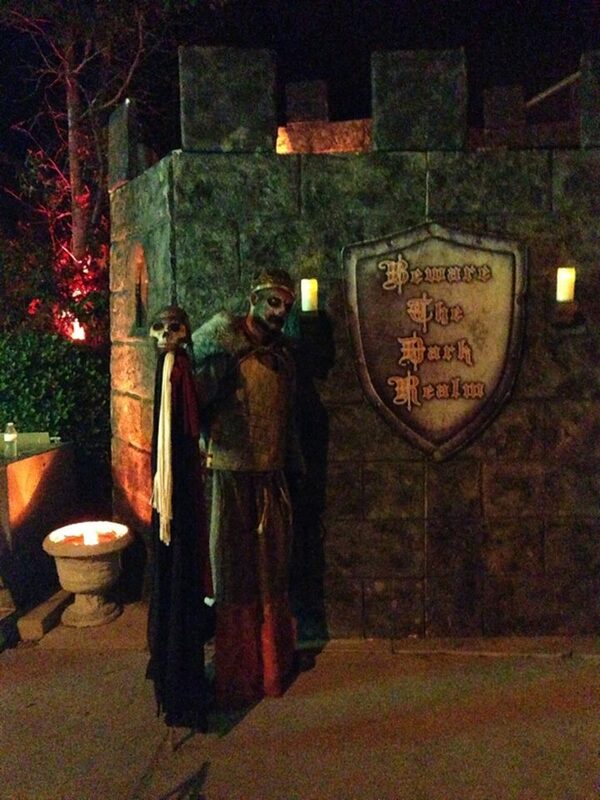 Hollywood Gothique ranked this #1 among Halloween home haunt walk-throughs in 2014. Two years later, it is, incredibly, even bigger and better. We noticed one or two familiar gags, but the dank castle has been expanded so much that it feels almost like a new attraction - more extensive and filled with even more incredible scares. The sets are great: there are some traditional narrow corridors with monsters blocking your path or appearing from nowhere, but there are also areas that widen out, giving the inhabitants of the haunted realm room to "play" with their victims (i.e., you). This really deserves a full-length review, but for the time being, trust us when we say this is a must-see on par with the Backwoods Maze and Rotten Apple 907. After visiting Beware the Dark Realm, Pumkin Jack's Haunted House presents us with a bit of a conundrum: Which is better? We'll take the easy way out and say that both are great, just different. Whereas Beware the Dark Realm is more extensive, with an imaginative dark fantasy tone, Pumkin Jack's haunt is contemporary, shorter, but with lots of scares packed into its space. 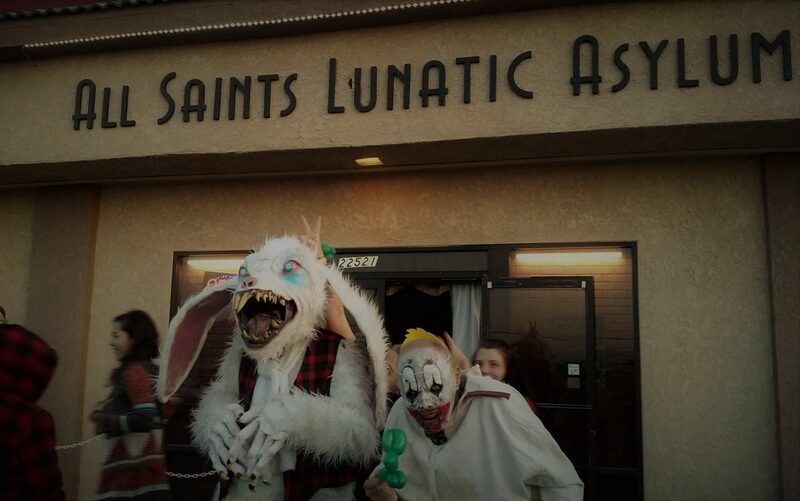 Pumkin Jack's went dark in 2015; the revised haunt is notably different, introducing a new, jokey theme based around what looks like a shoddy ripoff of Chuck E Cheeze Pizza - an establishment so run-down and ominous that parents would be crazy to take their kids inside. And adults aren't so safe either! The maze has a few funhouse-type corridors, but the proprietor works in construction, so many of the sets (including a motel reception area a la Psycho) are utterly convincing because they are essentially "real" (i.e., made from actual building materials, not cheap imitations). The focus here is more on jump-scares, with several well camouflaged hiding places. For better or worse, the ghosts and ghouls are not necessarily satisfied with delivering a single scare; they may pursue you at their leisure, enjoying themselves even more at your expense. Highly recommended. Note: Pumkin Jack's lists its city as Saugus, but Mapquest insists it's in Santa Clarita.